When Does Erythema Multiforme Happen? A skin condition proposed to be a result of hypersensitivity reaction from drugs or infectious agents. erythema multiforme is characterized by red to pinkish papules, macules and the hallmark “target lesions” that are distributed throughout the limbs and sometimes the mucus membranes. 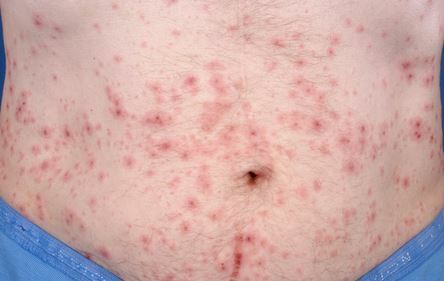 The red (erythema) rashes usually emerge after exposure to a drug or an infectious agent, for this erythema multiforme is considered as an allergic reaction to a particular agent. The emergence of the rash would vary from a self-limited rash to a life-threatening, severe one. Rash can present itself as small pink macules or papules, and as the condition progresses, the rash becomes large and widely distributed. Erythema multiforme rashes are usually located on the extremities, and rarely may involve the mucous membranes. The hallmark sign of multiform erythema rash is its target like appearance. Here the lesions appear pale on the center, and pink-red around the circumference. It can also be itchy (as in mild cases) and can cause abrasions and scratches in severe cases when the itching escalates. Herpes Simplex Virus (HSV) – This is the most common agent seen to cause erythema multiforme, almost 50% of the cases are attributed to infection of the herpes simplex virus. HSV has the capability to express its DNA on skin cells, particularly keratinocytes. When their genes are expressed in these cells, our body’s defense system forms killer cells to destroy the viral genes within the skin cells since it is a foreign body. The destruction of the HSV gene also causes the keratinocytes to be destroyed, and this process sparks the inflammatory reaction we seen in erythema multiforme. Mycoplasma pneumoniae – Another infectious agent seen to cause erythema multiforme is Mycoplasma pneumoniae. This is an agent that causes fungal infections especially in children. The toxins released by this fungal agent may be the cause of rash and lesion formation seen in erythema multiforme. This is done when the clinical manifestations are not clear. For patients with recurring erythema multiforme or for those with no history of HSV infection, skin biopsy may be done. It is important for the physician to take note of the distinguishing characteristics of erythema multiforme. This condition is usually fixed and present for at least one week, and lesions have the characteristic “iris” appearance or the so called “target-like” lesions. 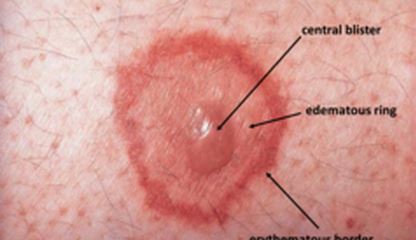 Other lesions only emerge for less than 24 hours (urticaria), and do not resemble the target appearance of erythema multiforme. This relieves the symptoms of inflammation such as redness and itchiness. These medications work by suppressing the release of chemicals that cause the inflammatory reaction of redness and itching. Antihistamines can cause dizziness, and so it must not be taken with alcohol or sleeping pills. Short term steroid use can cause sudden weight gain, facial flushing and increase in appetite. If steroids are used for a long period of time, gastric acidity and immunosuppression are the common side effects. This is given for patients with recurring condition and does not respond to Acyclovir treatment. A dose of Valcyclovir 500-1000 mg and Famciclovir 120-250 mg per day can be given. These are antivirals which halt the viruses’’ capability to strike damage to the cells. This is given for those with recurrent erythema multiforme who are not responsive to antiviral therapy. Dapsone 100-150 mg per day is given and is seen to partially and completely relieve erythema multiforme. Dapsone has anti-inflammatory and immunosuppressing action, this mechanism helps in suppressing erythema multiforme. This is given if other treatments were not effective; Azathioprine has immunosuppressing effects, modulating the overactive immune response we see in erythema multiforme. This is a potent drug which suppresses the production of chemicals that spark the immune response. In children, erythema multiforme is commonly caused by an infection rather than exposure to medications. Primarily causing erythema multiforme in children is the Herpes simplex virus and Mycoplasma pneumoniae. Since this is an infection, erythema multiforme in children is most often coupled with other symptoms such as fever, body weakness, sore throat, muscle pain and joint pain. No, erythema multiforme itself is not a contagious disease. This is a condition that is caused by an allergic reaction to medications or an inflammatory reaction to viruses and fungi. Erythema multiforme is not indicative of a contagious disease and must not be mistaken as a sign of measles and other viral exanthems. This is a severe life-threatening form of erythema multiforme; this type can be related to Steven-Johnson’s syndrome. A condition characterized by severe allergic reactions. Severe allergic reactions can cause anaphylactic shock, the event where a person’s airway is blocked and the blood pressure drops due to severe allergic reaction. This is the less severe and most common form of erythema multiform. This is highly associated with a Herpes simplex infection. This form is only limited to cutaneous lesions, and is not systemic as compared to erythema multiform major. This type of erythema multiform is characterized by bullous lesion formation. A bullous lesion is a type of a large lesion that contains fluid. 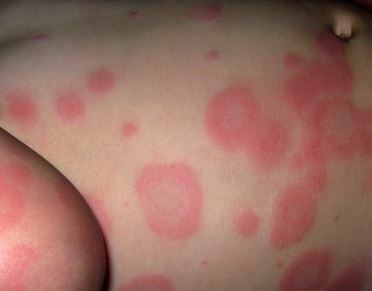 In bullous erythema multiform, the rash may initially appear small and flat; as the condition progresses the lesions enlarge and resemble vesicles that contain fluids. This is called a bullous lesion. 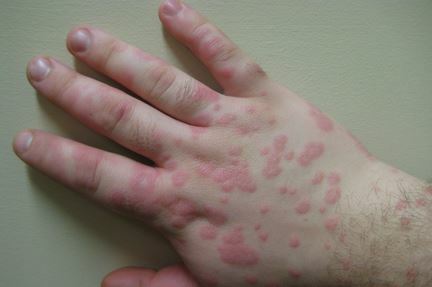 If the lesions are treated, but re-emerges again after sometime, the condition is called recurrent erythema multiforme. This usually happens as result of HSV infection which was unresponsive to the previous treatment. Suppression of the virus and prophylactic treatment of acyclovir is employed to prevent recurrent erythema multiforme, but in some cases higher dosage of antivirals and dermatological treatments are needed to prevent recurring episodes.